This is what my mom calls “doctored-up” baked beans. 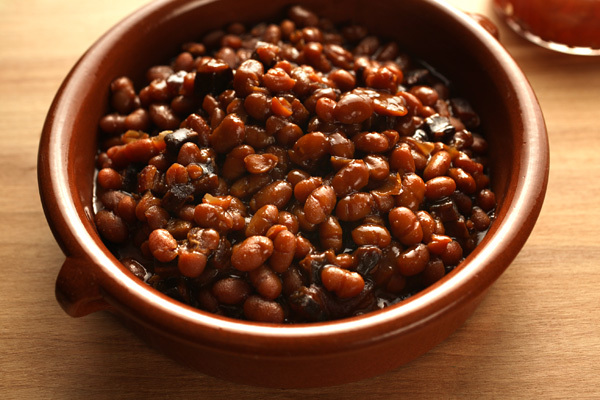 You take canned beans and add a few things to make them taste more homemade and yummy. I like this recipe, but I like to also add onion powder and 1/2 teaspoon of instant coffee to mine. It adds a deeper flavor that makes it seem like they’ve been cooking for hours. You could use decaf if you like, but the amount of caffeine is pretty small. anexactinglife suggests adding some cumin. It sounds worth trying. Click title for link to recipe. Sometimes I don’t bother with a recipe and just add some sugar (white or brown), a little catsup, onion powders and the coffee. I mix them in as I heat the beans on the stove and adjust these add-ins to taste. That sounds good. I’m always surprised at how much great flavor cumin adds to meat, so it should be good in beans too. Thanks for the suggestions, anexactinlife! My spouse adds cumin to canned baked beans with tomato sauce. It’s really quite good!